trade safely internationally, whether your customers are in the Republic of South Africa or further afield. 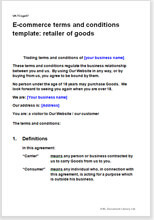 Website terms and conditions template: retail of hardware and licensed software is suitable for a business that sells products that use software developed or owned by the seller. This template is likely to be suitable for a manufacturer of an electronic product sells directly to end customers, or for a software house sells third party products with their software. We assume that you do not sell to distributors or wholesalers or retailers. If you do, you will need different terms on delivery, risk, retention of title (ownership) and return. The terms and conditions are valid for businesses based anywhere in the Republic of South Africa. This template complies with Electronic Communications and Transactions Act 2002 the Consumer Protection Act 2008, and other latest consumer protection legislation allowing you to sell to businesses or consumers.